The last time it happened was 1554, the year Lady Jane Grey was decapitated for treason, Princess Elizabeth was imprisoned in the Tower of London, and Mary of Guise, mother of Mary, Queen of Scots, became regent of Scotland. Historically, it would have been an omen of either good or evil, depending on the divinatory interpretations of magicians and astrologers (such as John Dee, private occultist to Elizabeth during her reign as queen). This year, the winter solstice, which falls on 21 December in the northern hemisphere, will coincide with a lunar eclipse, an event during which the moon passes behind the earth’s shadow, creating a lurid, red glow on the lunar surface. 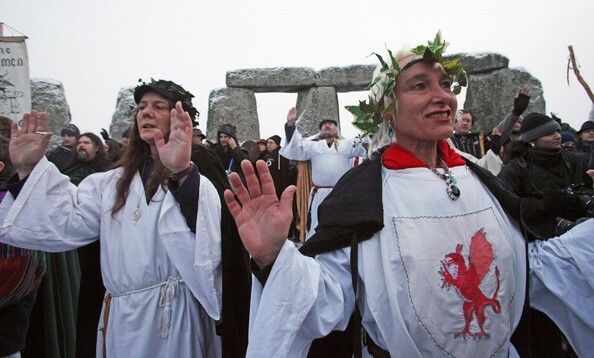 These events also mark renewal and the return of light, and it is with this interpretation that many modern-day pagans will be marking the occasion. Yuletide—the Norse and Germanic period beginning with the lunar midwinter and on which the Christian Mass of Christ is based—is a crucial date in the “wheel” of the year. Because this date marks the shortest day of the year, it is a harbinger of the return of light and the renewal of life in neo-paganism, Wicca, and other earth-based religions. Nicole Cooper, a high priestess in the Wiccan Church of Canada in Toronto, explains the Wiccan philosophy about the winter solstice: “It’s a ritual of transformation from darkness into light…. It’s the idea that when things seem really bleak, [it] is often our biggest opportunity for personal transformation.” For pagans like Cooper, the relationship between living organisms and natural cycles, and the effect of these cycles on such organisms, is paramount; it is also a metaphorical reminder of the importance of change and rhythm in one’s lifestyle. But the overlap of Solstice with an ominous, blood-tinged lunar eclipse has special significance for people who follow the Wiccan faith, and it may not be as foreboding as it sounds. She points out that both events involve a transit through darkness, the overcoming of that darkness, and the return of light, adding that the combination of these two events only strengthens this symbolism. “The idea that [both] the sun and the moon are almost at their darkest at this point in time really only further goes to hammer that home”, she explains. 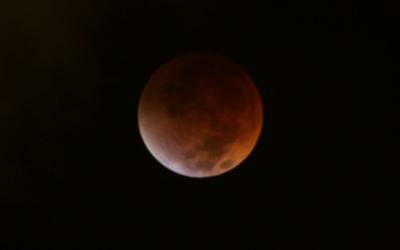 So if it isn’t clear already, the significance of Solstice is the fact that it marks the darkest day of the year and the return of life-giving light, and a lunar eclipse occurring simultaneously with Solstice might be seen as a sort of microcosm of this turning point, a harmonic echo or mirroring of the sun’s own darkest hour. And one need not be a Viking or pagan Iron Age farmer to be affected by seasonal changes. Astronomical cycles affect the weather, which in turn affects all living organisms on the planet—around the world, people are affected by floods, droughts, monsoons, hurricanes, ice-storms, even the Seasonal Affective Disorder which curses the inhabitants of the world’s most northerly regions in the dead of winter. So, whether one is a Roman Catholic priest, Protestant pastor, Muslim imam, British Druid, or atheist—in other words, regardless of one’s membership in the great world religions—the cycles of nature have an impact on everyone. This fact becomes even more obvious as the sun’s own regression is reflected in that of the moon, and as people all around the world take out their binoculars to observe the phenomenon. It doesn’t hurt that the cyclical, transitional nature of Christmas is followed by New Year’s Day, when people in the West make resolutions to change their lifestyle habits. We invite our ministers ordained online to share with us what this rare coincidence of solstice and eclipse means for them. How will you mark this special occasion, will you incorporate it into your holiday festivities, and what will your resolutions be for the New Year?